Happy hump day beauty lovers! It’s been about 2 weeks since I’ve last checked in with you guys and that’s way too long! I have quite the long (and interesting!) story about the massive changes in my life these days that I’ll be sharing with you very soon. In the meantime, I’ve got a lot of catching up to do with swatches and reviews! Starting with lots and lots of lipstick and eyeshadow. ? Last month, Too Faced released the Natural Love Collection for Summer 2017 and it was just as girly, frilly and cheesy as I thought it’d be. And I’m loving it all! Sorry guys! I’m a huge girly girl so I can’t help but be mildly obsessed with Too Faced as they’re the reigning beauty queens of all things girly. Including the new limited edition blockbuster Natural Love Eyeshadow Palette that’s been turning heads lately. Huge eyeshadow palettes like Natural Love aren’t new thanks to LORAC pumping out massive Mega Pro Palettes for the last 3 years. However, Natural Love still came as a surprise to many (myself included) because this is the first time that Too Faced has ever released a palette this big. 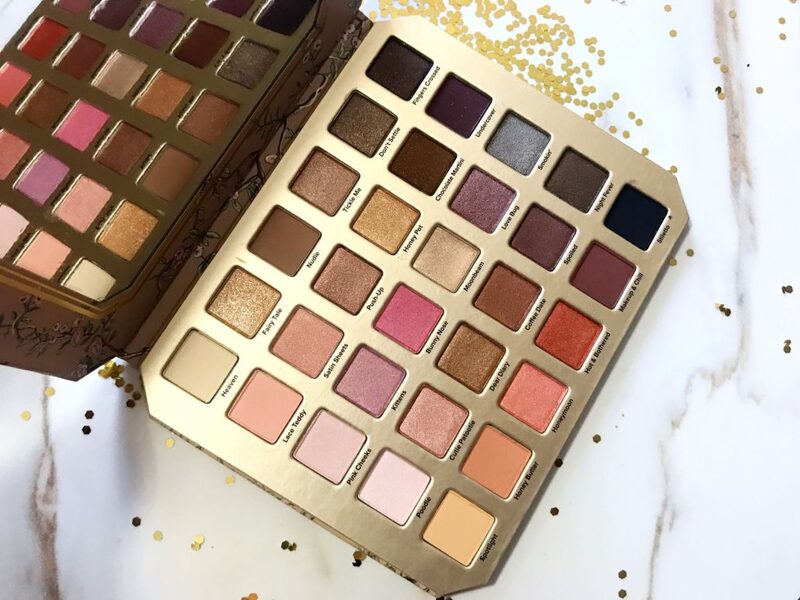 The Natural Love Eyeshadow Palette shook the beauty world with 30 neutral eyeshadows ranging from warm to cool in a variety of finishes including shimmer, glitter and matte. Because the Too Faced Natural Love Eyeshadow Palette is so huge there’s a little something for everybody. Which makes the Natural Love Eyeshadow Palette a hit for all skin tones ranging from fair to deep. Of course, Too Faced classic overuse of pale, chalky white based shades is still very apparent in Natural Love (hint the entire left column). However, the Natural Love Eyeshadow Palette is still quite usable for deeper complexions thanks to fun pops of color and vampy shades like Bunny Nose, Love Bug and Undercover. After the recent release of the Sweet Peach and Peanut Butter and Honey Palettes, there’s been a lot of talk of Too Faced skimping on their eyeshadow quality lately in sacrifice of the ultra adorable packaging we’ve grown to know and love (or hate). Thankfully, this doesn’t seem to be the case with the Too Faced Natural Love Eyeshadow Palette. Pretty much all of the shadows in this beauty (minus some of the more pale, chalky mattes) are nicely pigmented with a soft buttery texture that aren’t too powdery and blend quite well. I’ve used the Natural Love Palette a few times so far and I’ve been impressed every time at how pigmented and blendable the shadows are. Who knows? Maybe Too Faced has taken our complaints to heart and decided to focus a little bit more on the quality of the actual products inside the cute packaging again. I sure hope that’s the case! At the moment, I’m quite pleased with the Too Faced Natural Love Eyeshadow Palette and can’t wait to show you guys some looks. I definitely recommend checking out the Too Faced Natural Love Palette online and in stores at Sephora and Ulta before it’s gone!